If you’re dreaming of a new kitchen but can’t afford a pricey remodel. Then these budget friendly kitchen makeover tips will refresh your kitchen without breaking the bank. Start by clearing clutter and updating colors, these are just part of your new kitchen refresh project. CAD Pro helps you plan and complete any type of kitchen makeover plans with intuitive smart floor plan tools and kitchen design symbols. Share your budget friendly kitchen makeover plans with clients or friends and family using Dropbox®, Google Drive™, OneDrive®, and SharePoint®. Export files to Microsoft Word®, Excel®, and PowerPoint® with a single click. Your kitchen has a nice structure, which is one reason why you fell in love with your house in the first place. You’ve made some great meals and even greater memories in it over the years. Recently, you’ve noticed thought that your kitchen looks a little worn and outdated. Doing one or more of these budget friendly kitchen makeover tips will make your space look fresh and more high-end without the cost of a complete kitchen remodel. These ten updates are favorites among kitchen design experts. Your cabinets are the first things that you probably notice when you enter your kitchen. They are located just above eye level for most people and have the potential to worsen the look of your kitchen if they’re outdated or not properly maintained. If you inherited kitchen cabinets that are made of low-quality materials, then it’s time to refresh your kitchen with cabinets that are made of genuine wood. If your wood cabinets are in good shape structurally, consider cleaning them thoroughly and refinishing them. Letting the wood’s natural colors and grains show through on the cabinets is an option for some kitchen décor themes. Other homeowners take the opportunity to create drama by painting their cabinets in lively accent colors. If you decide to get new cabinets, try to reuse the old ones for storage in obscure places such as your garage, mud room or gardening shed. Sometimes it’s the little details that make a big difference in kitchen design and these budget friendly kitchen makeover tips. This is certainly the case with cabinet knobs, drawer pulls and faucet fixtures. Kitchen hardware comes in a variety of colors, shapes, and finishes and switching out old hardware gives your kitchen an instant boost. Some common hardware finishes for traditional kitchen design are antique brass, iron and bronze. Enhance a contemporary kitchen design with stainless steel, polished chrome and satin brass hardware. Consider color contrast when you choose new knobs, drawer pulls and faucets. Satin brass knobs look beautiful when contrasted with dark-colored cabinets or granite countertops. Installing a new faucet improves the function and look of your kitchen. You can get a model that has a vintage look or one that appears sleek and modern while you refresh your kitchen. Organization is one of the most popular budget friendly kitchen makeover tips. If you have a small kitchen but a large family, built-in bench seating gives you more options for your space. Most kitchen re-modelers install bench seats in kitchen corners that are near windows. Yours don’t have to rely on natural sunshine if you install the right lighting in the space. You’ll complete the look of your new kitchen nook by adding a dining table and extra chairs. This set up lets you seat more people in your dining area than a conventional dining room table and chair set will allow. As a bonus, many built-in bench seats double as storage in which you can stow away extra flatware, cookware, or linens. Non-perishable food items, spices, and dry goods that are placed haphazardly around your kitchen can make the space look cluttered and disorganized. Installing a custom pantry organization system is a good way to refresh your kitchen by creating a space for these items. Your built-in pantry can feature open shelving or the look of custom furniture. Granite countertops are a necessity for luxury kitchens. This stunning and durable natural stone will instantly make your kitchen come to life. For the hard-working home cook, these natural stone surfaces take chops, slices and heat from cookware without any signs of damage. Even if you’re not a gourmet chef, you’ll look like one with beautiful granite countertops. When you think about completely remodeling your kitchen, granite countertops are often too expensive to seriously consider. Updating only parts of your kitchen gives you the budget friendly kitchen makeover so you can splurge on the granite countertops that you’ve always wanted. Quartz, marble, soapstone, and Jerusalem stone are some other natural stone countertop materials to consider for your kitchen remodeling project. While natural stone countertops are durable, heat-resistant, and beautiful, they are porous and need periodic maintenance. Marble, Jerusalem stone, and granite countertops require annual sealing. You can keep soapstone countertops looking good by rubbing them with mineral oil monthly. When you refresh your kitchen and it includes an upgrade to your backsplash give yourself the opportunity to show your creativity and personal style. Today’s kitchens use all types of materials for backsplashes. It isn’t uncommon to see stainless steel, brick, concrete, painted wood and natural stone backsplashes in modern kitchens. Colored glass tiles also bring a dash of sparkle to your food preparation areas. Ceramic tile is the most versatile and cost-effective material for kitchen backsplashes. These tiles come in different colors, styles, and textures. They are easy to install and keep clean, and they don’t require any special maintenance. Whether you choose gleaming subway tiles or tiny mosaic ones to bring interest to your space, a new backsplash is an effective way to refresh your kitchen without spending a fortune. If your floor has deep stains on it and is starting to peel, that’s a sign you should invest in a new floor. You have many options from which to choose. Popular kitchen floor materials include hardwood, ceramic tile, travertine and vinyl. Hardwood is a lovely choice for many kitchens. Its warm hues complement spaces that are decorated in toasty shades of beige, cream, and tan. Wood floors that have deep, earthy tones help to ground the look of a contemporary kitchen design. However, this flooring might not be the right fit for everyone. Hardwood flooring costs more than most other flooring options, and you must wipe up spills quickly to avoid damaging the wood. Ceramic tile is durable and easy to keep clean and really helps your budget friendly kitchen makeover. It comes in a host of colors and textures; you can even get ceramic tiles that look like natural stone or wood. Travertine is a natural stone that wears well in traditional-style kitchens. It has better slip resistance than ceramic tile, but it requires more maintenance. Travertine stains easily, and you must promptly clean spills. You’ll also have to seal the stone tiles every year. Vinyl flooring is durable and easy to clean. It’s a cost-effective flooring solution for a kitchen refresh. If you’re like several homeowners, you’ve completely fallen for the new appliances that are available for today’s kitchens. You can get state-of-the-art appliances that stay hidden behind custom cabinetry, or you can pick a stainless-steel appliance package that gives the look of a professional kitchen. New refrigerators and freezers feature more efficient designs for food storage and many of them incorporate smart home technology. Did you see a recipe on You Tube that you want to try? You can get a sleek and trendy refrigerator that has an integrated computer screen on the door, which makes following online recipes easy. While offering a high-tech look when you refresh your kitchen. When remodeling kitchens, many property owners neglect to install adequate lighting to make their spaces more functional and inviting. Ambient, task and accent lights are the three types of lighting for homes. Ambient lights are general lights to brighten up your kitchen and task lighting shines above kitchen work areas such as islands, countertops and stoves. You can use accent lights to bring focus to special architectural details in the room or wall art. Designers recommend layering all three of these lights within a space for function, safety and beauty. Adding a fresh coat of paint to your walls is an easy trick to make your space more inviting and luxurious. A new paint color can instantly enhance the look and feel of your kitchen. The paint color also has the power to inspire creativity, soothe moods and entice more buyers. When choosing new paint colors for your kitchen upgrade, let your cabinet, countertop and flooring colors be your guide. If you’ve got some beautiful, natural stone countertops that you want to make the star of your kitchen, then choose kitchen paint colors for your walls and ceiling that complement the warm or cool color of your countertops. A paint professional at your local hardware store can help you with paint color selections based on your home design and your personal sense of style. Before painting, make sure that you fill any holes in your walls. Also, it’s important to use painter’s tape and drop cloths to protect kitchen fixtures from getting damaged by paint. After preparing your work area, you’re ready to prime and paint the walls and refresh your kitchen. Many high-end kitchens are notoriously generic, and that attribute doesn’t get better with age. You can add trim to your kitchen to give it a budget friendly kitchen makeover with a more decorative and polished look. Crown molding is a trim option that brings out the best in most kitchens. It comes in different styles, widths and materials to fit your kitchen design and budget. Chair rail was traditionally used to protect walls from scratches and scuff marks that were caused by chair movement. However, it’s now used as a popular decorative kitchen trim. You can also install wainscoting beneath chair rail, around kitchen islands and on backsplashes to give your kitchen more character and dimension. You can paint crown molding, chair rail and wainscoting in classic white or in shades that enhance other color choices in your kitchen. 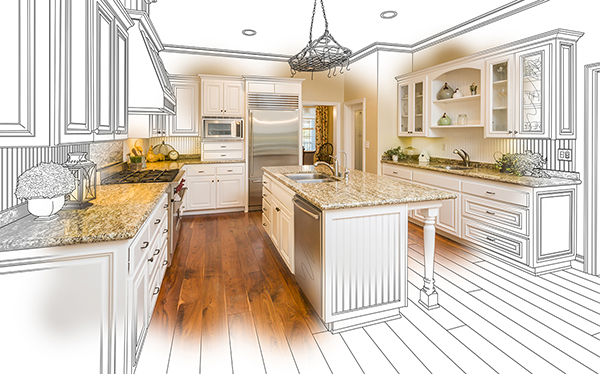 CAD Pro has helped thousands of homeowners, remodeling professionals, builders and contractors plan and design all types of kitchen makeover projects. CAD Pro is used by NHBA builders and contractors. This entry was posted on January 31, 2019 by Home Pro News.